John Quigley graciously accepted a scroll from the City of Calabassas and the kudos of a smart crowd of Santa Clarita environmentalists at the dinner held to raise funds for the Santa Clarita Oaks Conservancy. Gabrielle Benton, a fellow "tree sitter" and artist, created a unique honorarium for the other "treekeepers" made from a slice of the amputated surface roots of Old Glory. Lynne Plambeck and Cynthia Harris, together with Keith Prisker and his family put this event together to raise funds for the further legal defense of the TREE SIT and other activities in the area. May 21,2003 Old Glory now boxed on sides (but not the bottom)Old Glory is not yet "undermined" and awaits this final boxing step before the actual moving can begin. 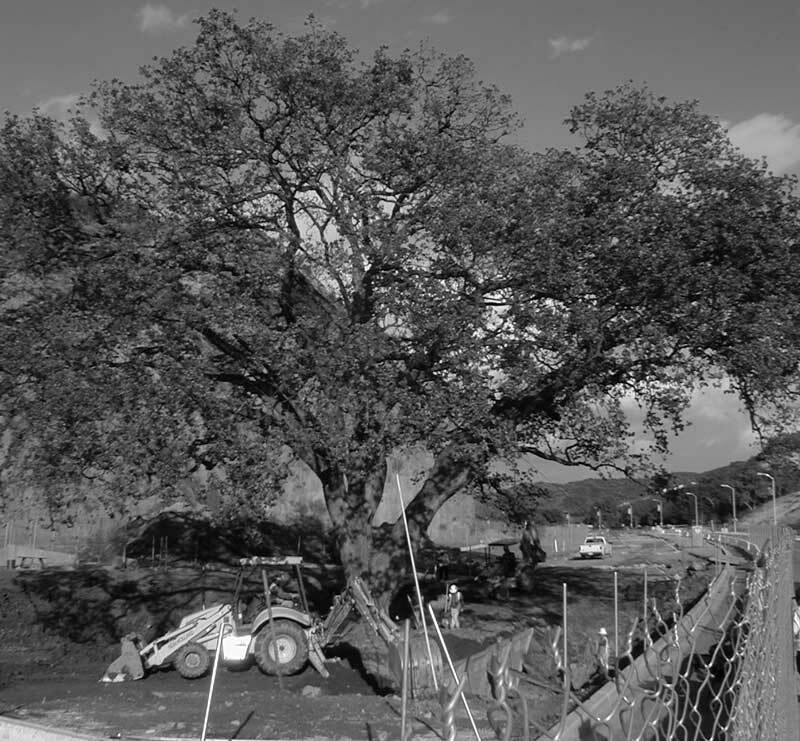 The SENNA Tree Company is working methodically to keep the tree "healthy" despite the trauma of its roots being cut. There is significant energy in the trunk to keep it leafed out, despite the lack of water and oxygen uptake now. The NEWHALL RANCH hearing was a major success, thanks to about three dozen activists... Everyone arrived at the Hearing Room at 9:30AM and after a certain amount of confusion, settled in for the proceedings. Ironically it was Cesear Chavez Day at the hearing and we were entertained by mariachis (as well as the usual kittens and puppies.) 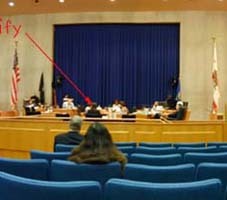 When the hearing got down to the Agenda Item 11, the Chaiman got the fully attention of the filled hearing room. The Proponents of the project were asked to stand and show that they wished to cede their time to the four designated speakers. 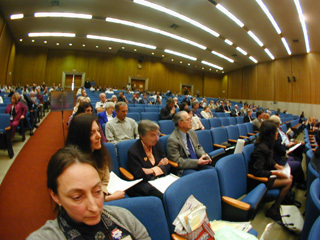 The entire rear of the hearing room stood en masse in a dramatic gesture intended to demonstrate the "tremendous support" the Newhall Company could bring to Supervisors. They fielded only seven speakers, who did not address the issues the judge ruled on, but instead "pitched" how great it was going to be for the project to go forward. Our group of thirty six by comparison, was quite focussed on the six points and really hammered home the environmental message: "the EIR" needs to be revised!" Antonovich brought a motion to the table, which delayed the vote, opened the documents up for public review and gave us some room to r-e-a-l-l-y get specific. You should be proud of the group that came down! The SENNA TREE men are now deep into the Western side as shown in Larry's photo. The bottom of the slanted box is its "true" size; the upper part is back filled with loose dirt after the side is strapped on. A group of about twenty supporters gathered at the corner of Wispering Oaks and Pico, opposite OLD GLORY, for a twighlight "vigil." This gathering will hopefully be the first of many, allowing the public to demonstrate its support - despite the fences, guards and "unwelcome" put in place by Laing Homes. A daylong conference in which many long and short term objectives were discussed, was held in Valencia with group of supporters of OLD GLORY. John Q. guided the meeting through the formation of various "action teams" each with a unique focus. The end goal is to build the strength of our coalition of the various groups and interests. I heard a blurb on KPCC that Old Glory has had it's roots cut and that they are about to move it. Does anyone else have more info? 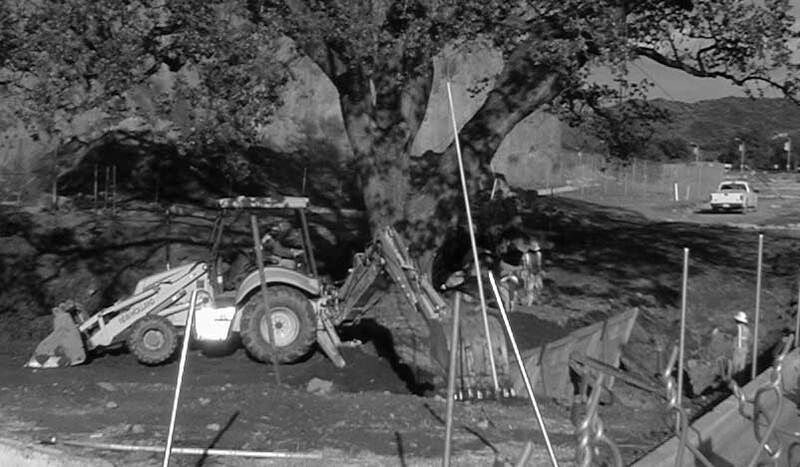 Yes, sorry to report that its true, the SENNA TREE COMPANY began excavation on two sides of the tree using two backhoes, digging six feet deep trenches. The trench on the South side of the tree got a large wooden panel lowered in and shored against the root ball. The gaps were filled with great mounds of dirt, tamped in with the bucket. The process began in the rain on Monday, and continued yesterday (while I was meeting with the county about how to reroute the road, and stop any work on the tree through a challenge to their permits!) Today was a total surprise; we had scheduled a press event with Cynthia Harris to present a donation check and to discuss the realignment of the Pico Canyon segment at Dead Horse Canyon. Thankfully there was a significant press presence and three helicopters, a couple of news vans and the major LA publications all managed to look in at the horrific deed. Matt Zubal, John Q., Travis, Jerry, Jeff Johnson and several others of the "Coalition to Save Old Glory" showed up for the press conference and were there to witness - from outside the armed guard patroled perimeter fence. What does this mean for the tree? At this time all of the roots are NOT cut, and if SENNA were to stop right now, it would be better than the complete amputation and strangulation of the roots involved in boxing and moving. We are still attempting to put a stop to this - through several avenues, all of which are "political" (meaning that we need support from the "authorities" in the county government to work with us against the Public Works plan of making the expressway.) Its a tall order. In the meantime, let SENNA, Laing and the County know how concerned you are about their actions. The tree is in full bloom and looks fantastic, there is no new development down the road for years and yet here they are spending hundreds of thousands to prove to you and your family that they care about this tree. Hold the image of the growing, eternal tree before your eyes and pray! 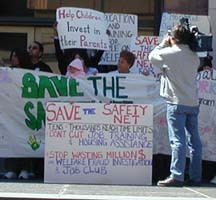 Automatically SEND LETTERS and FAXES to the Los County SUPERVISORS and SENNA !! Only Tom and Robert Pittman showed, but the agenda was light and after a little administrative wrangling, Tom again addressed the Supervisors, this time on an Agenda item put up by Antonovich to "promote the equestrian lifestyle" in conjunction with the city of LA. Tom made the point of supporting the concept of open space, but contrasted the currently thinking in planning as inconsistent with this "traditional western" lifestyle. The supervisors listened for one minute, but the comments made the press. Go figure. Only a few of us showed up for this event, but it was still productive. Tom commented on the agenda item relating to the destruction of four oak trees in a county park in the fourth district to make way for a library. Instead he suggested that they should transplant these small 8inch established tree, and unlike the 90in Old Glory, their chances for survival would be good. 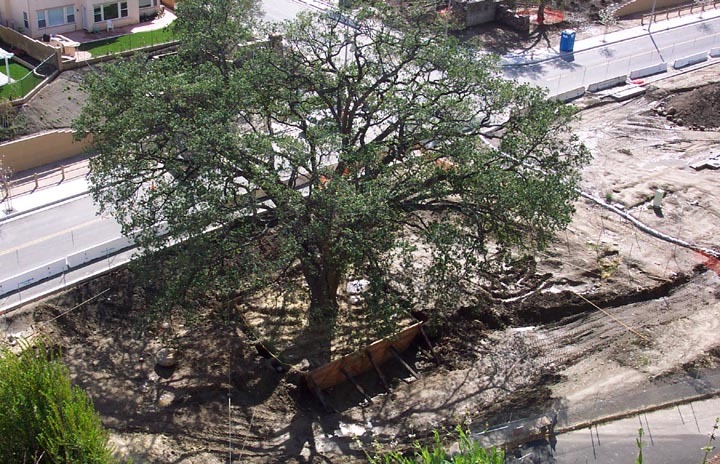 (Thus bringing Old Glory back into the hearing room, but trying to save other oaks as well) Tom's further suggestion was to move the trees to the fifth district to a park under construction, to commemorate the fallen Deputy March. The Board actually liked this idea, and told staff to figure it out. Natasha Walton gave testimony in the public comment period, without interruption for he full three minutes. Her points on the survivability of the tree were well made, and at the end Yvone Brathwaite-Burke said, "yes, we hear you, every week!" Showing that we are continuing to make an impression. Two dozen Save Old Glory supporters including celebrities, road experts, tree experts and caring children and parents went "downtown" with written testimony, speeches and a well produced PowerPoint presentation. In a surprise move, Chairwoman Supervisor Yvone Brathwaite-Burke changed the rules and the time for each speaker was reduced to one minute. Fortunately the "heat" just made it more obvious that the Supervisors are not yet getting the message. We must keep coming back! OLD GLORY still stands on PICO! 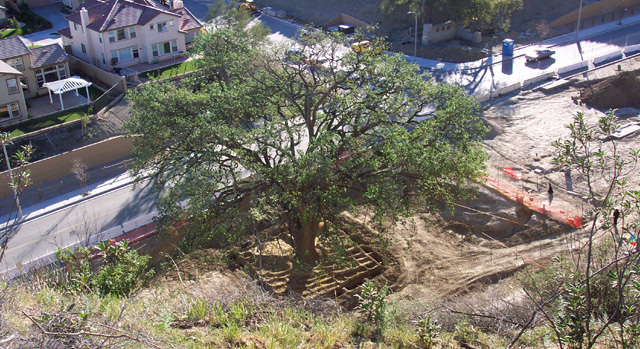 The current pictures taken by volunteer Glen from the cliff show the work done by SENNA Tree Company to prepare the oak for moving. Currently the tree is being fed to stimulate root growth, and to our knowledge the root system remains intact. The tree is very vulnerable as it is "pushing" a lot of energy to leaf out. The County Board of Supervisors is going to meet again on Tuesday Feb 11, 2003 and we hope you can join us at the PUBLIC COMMENT period which follows each meeting. Each member of the public can address the Supervisors for no more than three minutes, but you can also submit six copies of written testimony. Our objective is to get the Supervisors to direct County Public Works and County Regional Planning to reconsider the road plan for Pico - with reduced speed and capacity specifications so that the "alternative" road designs that Save Old Glory will meet county standards. A rally was held on Saturday 1/18 in front of Newhall Land headquarters to show support of saving Old Glory, and to protest Newhall Ranch and to dessiminate information about this proposed monstrosity which is behind the removal of Old Glory. By 11am there were 60-70 people gathered, and passing cars honked their support. Many children came, learning a valuable lesson in civic responsibility and citizenship. Ultimately this area will be theirs, and saving some of the natural beauty and habitat for them seems as obvious to adults as saving Old Glory is to the children. Information about Newhall Ranch was discussed, including maps and photographs showing previous environmental affronts by Newhall Land. 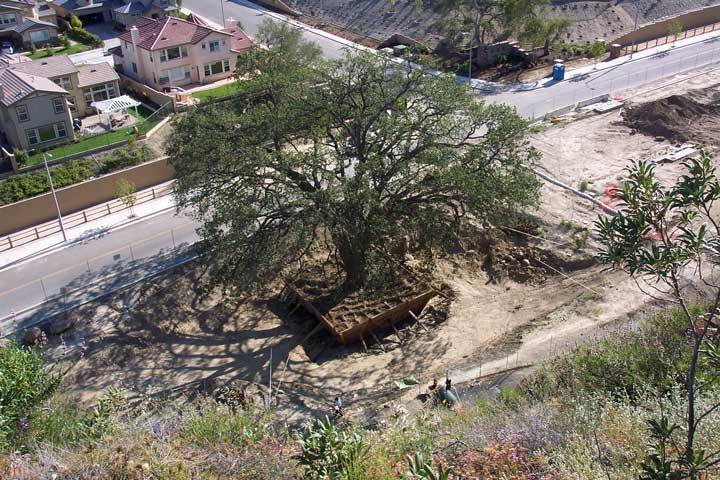 You can see the backhoe to the right of Old Glory in this westward view up Pico Canyon. It also shows the room on both sides of Old Glory for a split road. Obvious as it is to the community, the County can't see a way to fit a road on the right only slightly wider than the one on the left..
You can see how close to Old Glory the backhoe is getting. There is nowhere near the rootball size being taken that a giant such as Old Glory would require. The claim that the tree is being moved before it leafs out is seen to be false, as this photos show. Old Glory has broken out it's leaf buds for the year already, and is therefore in need of massive anounts of water and nutrients, which it will no longer be able to get form its severed root system. In its 400 years of adaptation it has never had to deal with such an attack. Please write Antonovich, Laing, and Senna and register your outrage over this attack upon our community's heritage. Addresses are below. CONTINUED! See these pages for the earlier events. EARLIER! See these pages for the earlier events.